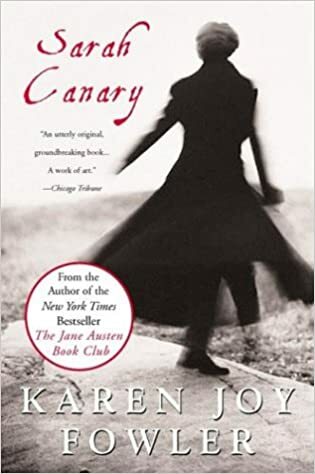 Karen Joy Fowler’s 1991 novel Sarah Canary is set, for the most part, in rainy Washington state in the late 1800s where men are violent, women are sexual objects, and brown people and the mentally ill are always in danger. The tale is told through the perceptions of the Chinese railway worker Chin Ah Kin, his accidental accomplice B.J., and a disembodied voice of authority who imparts the most up-to-date facts of science, history, and culture. Sarah Canary never speaks. She hums and chirps (hence her name) and also growls and howls. She steps out of the fog and into a forest camp where the railway workers have paused for lunch on their walk from Seattle to Tenino in search of work. When they are unable to send her away, Chin is charged with returning Sarah Canary to wherever she belongs, which they determine to be the mental hospital in Steilacoom. Nothing goes as planned, of course. Chin escapes Steilacoom with his life and his new companion B.J., sprung from the mental institution there, and who, among other difficulties, is never quite sure if he is walking on an incline or on flat ground. Sarah Canary eludes them both, and the peripatetic chase is on. Between Steilacoom and San Francisco where their pursuit dissolves, they meet a string of characters anyone might have encountered at that place and time: native people, a huckster, a sea captain, an outspoken feminist, a sheriff and a decomposing mermaid sewn from the corpses of a monkey and a salmon. This is a perfect book to take on a trip, especially if you will be traveling in the Pacific Northwest. It is funny, philosophical, and suspenseful. The more slowly you read it, the better it is. The language and the imagery are superb. When you get to the end, turn to the beginning and start over. It’s that good.